Introduction – Welcome to the Bytheway Software Development Lab (BSDL) factory support web page. WingStuff and the BSDL entered into a partnership to provide a software product that can be used for by the digital music players being sold by J&M and BikeMP3. This software is sold exclusively by WingStuff via the Internet. Product Description – This software was specifically built for the Gold Wing GL1800 music players to populate and arrange MP3 and WMA songs on your USB Thumb drive with just few clicks of your mouse. Works with ANY BRAND GL1800 Digital Music Player including the 2012+ Goldwing integrated player, BikeMP3, J&M, DMC that require USB Flash Drive or SD Memory Card to operate. Designed to work with WindowsXP, Vista and Windows 7 operating systems. The Music Player Software offered only by WingStuff allows the user to control the play order for the BikeMP3 and J&M players, otherwise the play order is determined by either the file name or load order for the USB or SD memory device. Gold Wing GL1800 Differences - what's new in 2012? The GL1800 display for years 2001 thru 2011 is only capable of displaying a single-digit CD volume (0 to 9) It also only displays Tracks numbered 1 to 99. 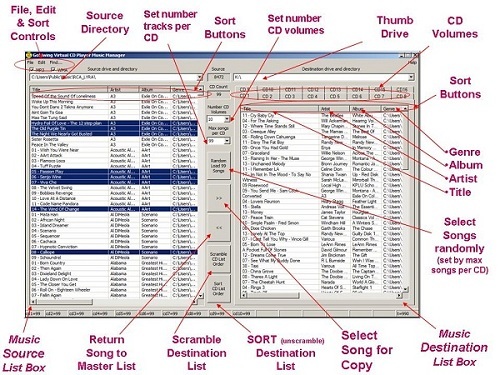 Some players allow the user to overload the number of volumes and tracks, but it's a guessing game as to the actual CD volume and song track being played. The following table shows a comparison between the different music player products. The iPod® and iPhone® interfaces to the player via a USB cable interface. For 2012, Honda added new improvements to the audio system which include an integrated iPod® and MP3 player accessible through a USB connector in the trunk. It's controlled the same way as the BikeMP3 and J&M players via the handle bar control and also add a random-play or sequential-play feature using the radio button control panel. The display shows up to 999 CD volumes and 255 tracks/volumes. The iPod® and MP3 interface is similar to Hondaline radios found in newer cars and also after-market in-dash radios with USB interfaces. The software can still be used very effectively to load the USB Flash Drive with MP3 and WMA music formats for both the 2012 GL1800 and automotive in-dash radios. Software Download – Download the Non-Activated Version of the Software by clicking the DOWNLOAD LINK shown below. You will REQUIRE A PASSWORD KEY that will be emailed by WingStuff to you usually by the next business day (excluding weekends) after your online purchase to Fully Activate your new software. Following are several video tutorials showing you how you can populate your USB/SD memory devices. Software tool advantages and features. Procedure for converting iTunes music to MP3 using the Microsoft iTunes software. The process becomes quite easy after you do it the first time. We recommend converting all WMA music formats to MP3 for both the J&M and BikeMP3 music players to reduce compatibility problems. Having problems with downloading and installing the ZIP file from WingStuff. While very rare, the BSDL provides an alternate Windows Installer MSI format for getting the software. This is a copy of the help window that is distributed with the software. It walks you through all of features of the software and provides the basics on how to use the software. The companion software has not been tested using the MAC running the Microsoft Window emulator. Since the download is free, we encourage you to try it and let us know if it works. Visit the BSDL Download page for a non-soundcard version if you are having problems running the sound card preview version. The companion software does run under LINUX Fedora (free version of Redhat) just fine. The secret is to install "Wine". Wine is a Open Source software application that allows computer programs written for Microsoft Windows to run on Unix-like operating systems. If you are using KDE, install it using KPackageKit Software Management under System tools. You can then create a desktop shortcut and use it just like any other GUI software application.